This story from the year 1990 is about my first bull moose. This particular year was actually my second year moose hunting but unfortunately the first year I did not get a moose. 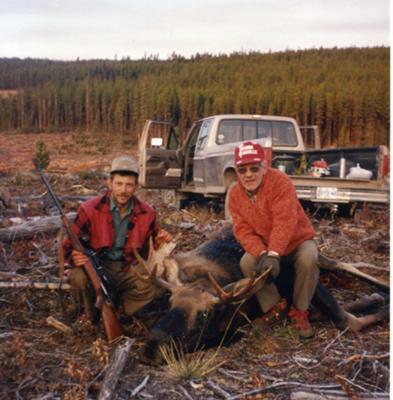 There were however a number of other moose hunters in our hunting area that were successful during that first trip. Enough so that I felt with some time spent learning about moose and their habits, I too would get a chance to harvest the elusive bull moose. We scheduled a 10 day moose hunt in the Caribou region of British Columbia. We chose the first 10 days of the season figuring the moose would not have been pressured by hunters yet. I had spent many years hunting Elk, Mule and White-tailed deer therefore I felt I had enough hunting experience to take on moose hunting. We are DIY hunters and do not rely upon guides to take us to the game, we must locate, stalk and shoot the game ourselves. The area we hunted for bull moose is a 10 hour drive from home so we only have hunting season to become familiar with the lay of the land. Our limited exposure to the area forced us to do a lot of road hunting those first years. On the third evening we spotted a respectable bull at the back edge of a meadow but it was too late in the day to start a stalk. It would be dark long before we could get within range of that bad boy. He would have to wait until morning... we hoped he would remain in the area! The following morning found us sitting at the edge of that meadow as the first signs of daylight started to show. At first there are gray blobs everywhere, we strain our eyes through our binoculars hoping that one of those blobs would move. As the morning progressed and darkness gave way to light, each one of the blob moose revealed either a bush or an old stump. Nothing moved and no bull moose to be seen. After returning to our vehicle, we decide we wold have a cup of coffee. Just poured and steaming in the cold morning air, we could hear a vehicle approach from the rear. My cousin and my uncle appeared in the camper van we dubbed the "White Elephant" (because of its shape). They pull up alng side for a visit. We explain how the morning had unfolded and that they should proceed up the road ahead of us because we had just poured the coffee. They agreed, and we sipped our coffee as we watched disappear over the rise. The van could not have been out of sight for more than 30 seconds, when suddenly a rifle report echoed through the valley. My dad and I looked at each other in amazement... without uttering a word we dumped our coffee and jumped into the truck and sped of in the direction of the rifle shot. Oh, we knew what had just happened... we just sent those guys up the road to shoot a bull moose... Our Bull Moose! Sure enough as we crest the hill my cousin is walking towards "his" first moose. It should have been ours, serves us right for being gentlemen and letting them go ahead. Darn!! We do all the work that is required and get the moose back to camp. Six days later on the tenth day... last morning out, we pull it off. We had been traveling down an old logging road heading to where we though was going to be the lucky spot. Long before we arrive as we rounded a bend i n the road my partner says "moose", I slam on the binders. "Where" I ask as we slide to a halt. "There, just heading through that cutblock. I don't know if it is a bull or not, but it is a moose", says my partner. I jump out of the truck and run through the small strip of trees that shelter the cutblock from view. I peer out into the opening, and there standing broadside at about 70 yards stands a beautiful bull moose. I catch my breath and settle the cross hairs of my 30-06 rifle. Bang! Through the scope I watch in amazement as dust from the side of the moose kicks up as the bullet impacts. Good hit! I think to myself, but I jack in another round just in case. The follow up shot is not necessary as the bull collapses on the spot. Summing it up in one word... ecstatic! I just harvested my first bull moose.